Structure System, Colegio Montealbir, El Casar (Guadalajara). Martín de Lucio Architects (Alberto Martín de Lucio y Carlos Rodríguez Pérez). 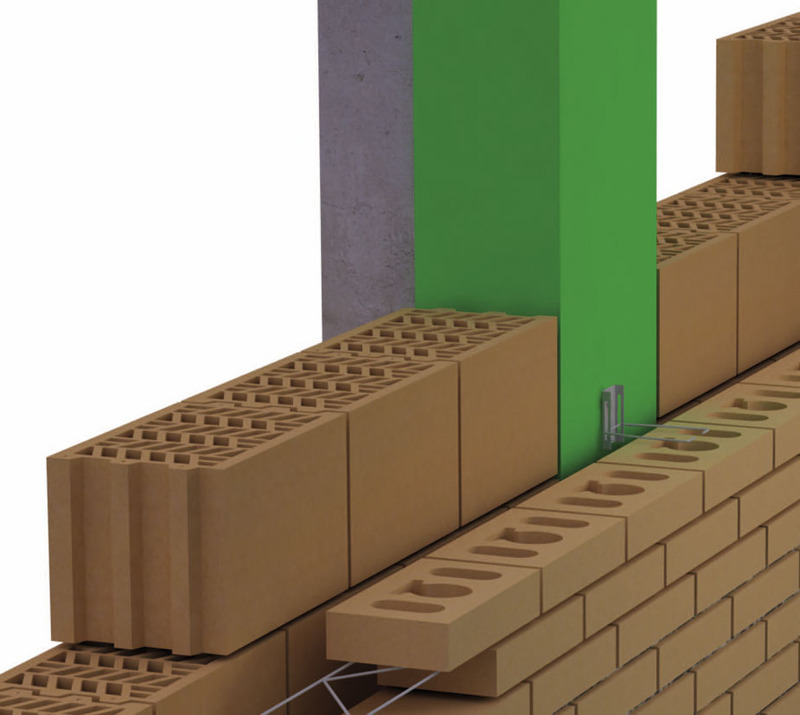 Palautec promotes the feed-through or ventilated facade Structure System with face brick. This system develops the self-supporting face brick facade, using the brick itself as a self-supporting structural element, and the G.H.A.S. construction procedure (Geo-Hidrol Advanced System). The Technical Building Code (CTE) represents, for ceramic brick enclosures, the legal framework which backs the project, estimation and execution of conventional facade solutions. Likewise, with CTE approval an unlimited field of possibilities opens up for the development of new solutions with greater technical and functional performance such as the Structure System. This system is fundamentally based on the use of all the structural analysis resources available and explicit within the Basic “Structural Security: Brickwork” Document in order to achieve the most advanced enclosure solutions with regard to technical performance, using the opportunities for traditional ceramic pieces to the utmost. The success of the Structure System is due to its extraordinary constructive simplicity, its high functional performance and the low cost of the solution. The system is fundamentally characterised by the outer leaf of the enclosure being built tangentially to the structure of the building and therefore the facade, separate from the structure, is self-supporting as the weight is transmitted through the brickwork itself, making use of its resistance capacity under pressure, and contributing to resistance against horizontal forces. The brickwork rises up from the floor, avoiding putting weight on the framework and the insulation is attached on the outside of the inner leaf thereby protecting against humidity. The system permits, where this is considered to be opportune, the passage of a chamber with continuous insulation throughout the whole enclosure. The Structure System brings back the traditional character of brickwork as supporting element, and thereby manages to eliminate complex and sophisticated support systems to transfer the weight of the enclosure to the structure. To do so the analysis resources explicit in the CTE are used. The Structure System also brings ventilation to the chamber inserted between the external leaf of the enclosure and the building, which considerably increases the hygrometric performance, incorporating all the attributes of a ventilated facade. This is executed leaving hollow vertical joins in both the lower and upper part of the facade in such a way that it provokes the chimney effect. Unlike the rest of the ventilated facades on the market, this system is characterised by maintaining the beauty and aesthetics of the conventional face brick facade, and adding to it the maximum technical and functional performance, typical of this type of facade. Its fundamental and indispensable component is the Geoanc stainless steel double movement tie whose purpose is to guarantee the stability of the external leaf, thereby preventing any risk of fissuration. The ties permit certain differential movements between the brickwork and the structural element upon which it is attached. The Fisofur plumb-line trussing is another of the important elements in relation to the prevention of fissuration. Further elements of the system are the joint lockscrews although depending on the conditions of each project some of the components of the system may be dispensed with. In the Structure System all the movements and pressures on the brickwork are controlled. Improves the energy efficiency of the building, eliminating thermal bridges and thereby ensuring continual insulation. The flatness of the enclosure along its height is guaranteed regardless of the tolerance and deformity of the structural elements. Optimization of the constructive process thanks to the ease and speed of execution. 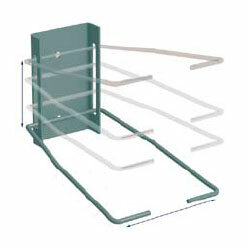 Eliminates the use of boards in framework and pillars. Its constructive simplicity. It does not require installers or specialist personnel. The labour required is the same as for conventional face work facades. It is the most economical ventilated facade on the market and very similar in cost to conventional facades. In summary, we maintain the beauty and aesthetics of the conventional face brick facade, improving its behaviour and performance at a much lower cost than any other ventilated facade on the market and we thereby contribute towards sustainable development: less heat in summer and less cold in winter thereby producing significant energy savings. Palautec will provide you with a free and personalised quote for your project, without any obligation whatsoever. This quote and study guarantees the stability and non-fissuration of the facade. The quantity and distribution of each of the ties and other elements is determined with a personalised analysis of each project. In order for us to do so, you must provide us with the geometric characteristics and the support characteristics of the enclosure walls (download and complete “Data gathering sheet – Structure System” which is located in the download area, in the documents of interest section), as well as the AutoCAD project plans relating to the enclosure. You can send us the information via email: marketing@palautec.es together with your contact details.